Starting a business is exciting — and scary. 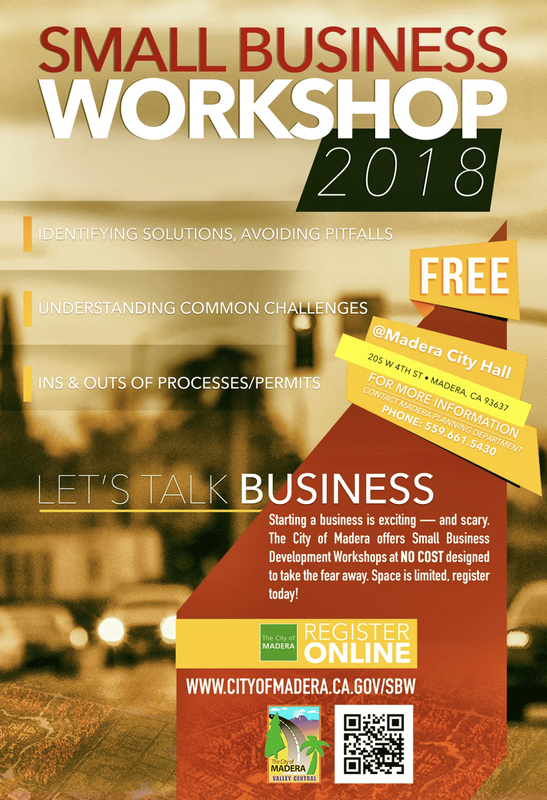 The City of Madera offers Small Business Workshops at NO COST designed to take the fear away and equip entrepreneurs with some of the essential knowledge needed to make a new business excel. Of the many businesses that open each year, many fail to last. Though there is no guarantee for success, an entrepreneur who has properly prepared has a leg up on the competition. Our Small Business Workshop Series is centered around specialized subjects and management basics for new business ventures. Space is limited, sign-up today! PLEASE NOTE: Registrations for the April 23, 2018 Small Business Workshop must be submitted no later than Friday, April 20, 2018. Applications received after this date will be kept on file and applicants will be contacted when the next run of the program is scheduled. There will be NO CHARGE or FEE to attend Small Business Workshop classes. This program is offered as a public service by the City of Madera. We want you to succeed! Having said that, space will be limited to 30 participants. Because of this, applicants will be registered on a first-come, first-served basis. Register online using the web application below. What topics do you hope to learn more about in the Small Business Workshop program? What type of business are you most interested in starting? I, , hereby grant consent to the City of Madera, and/or its agents or representatives to allow the City of Madera, and/or its agents or representatives, to consider my application for the purpose of facilitating my participation in the City of Madera's Small Business Workshop program.